I know Thanksgiving Day is over and my post is really late. I had a problem with my computer, still have a few issues but at least its working. 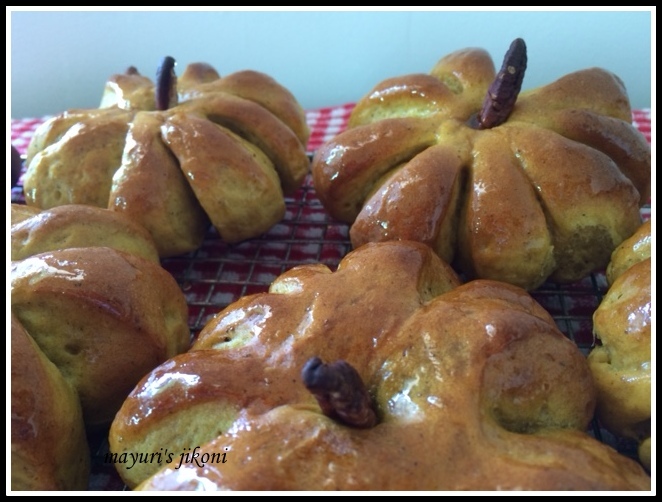 Aparna the host for We Knead to Bake challenged us to bake these very cute and yummy pumpkin rolls. Before I share the recipe for these spicy rolls, I want to share with you what is Thanksgiving Day. I too didn’t know why the Americans and Canadians celebrate this day. For US Thanksgiving usually falls on the fourth Thursday of November. This year it was on the 26th of November. Whenever you look at pictures or cards, they usually show autumn leaves, pumpkins, turkeys, corn, cranberries etc.Thanksgiving Day usually means a family lunch or dinner with turkey stuffed with vegetables and is served with sweet potatoes.Many cities and towns hold a Parade. Most families watch football together on this day. Thanksgiving is a feast to celebrate the harvest. Pilgrim settlers – the Dutch settlers of Plymouth Colony use to celebrate the feast after harvest.It slowly spread to the other communities who use to celebrate it on different days. George Washington declared it as a National Holiday.Dates were changed several times by subsequent leaders till it was decided that the whole country celebrates it on the fourth Thursday of November. Canada celebrates its Thanksgiving Day on the second Monday of October. They too celebrate the bountiful harvest. As Canada is north of US, their harvest season comes earlier. Churches are decorated with fall harvest like pumpkin, corn, etc. Canadian Thanksgiving is more connected to the Europe than US. Its a festival of harvest and thanks for everything in life. Like the Americans they too celebrate it with family and prepare turkey, sweet potatoes, fall vegetables etc. Preparing the spiced pumpkin bread rolls was fun. They turned out soft and spicy. Creating the pumpkin shape was a bit of a challenge. Sieve flour, salt, cinnamon powder, tea masala spice(allspice or pumpkin pie spice) and ginger powder together into a big bowl. Add sugar and yeast and mix into the flour. Mix pumpkin puree and milk together. Add butter to the flour and mix into the flour.Add egg at this stage if you are using it. Add the milk and pumpkin puree mixture and form a dough. Knead the dough for 10 -15 minutes (by machine 5-7 minutes) till it is soft, silky and smooth. Shape the dough into a nice round ball. Put the dough into a greased bowl. Cover with cling film and leave it in a warm place to rise till it is double the size. Mine took 1hr 15 minutes. Knead the dough gently and divide it into 10 -12 parts. Grease a baking tray using some butter. Shape one part of the dough into a round ball. Flatten slightly using your palm. Using a sharp knife or scissors, cut the edges,leaving the centre intact, to give 8 segments.Much like the petals of a flower. Repeat steps 12 to 14 with the remaining dough. Let the rolls rise for 45 minutes. Using the back of a wooden spoon,rolling pin (thin) or your finger, make a hole in the middle of the roll. Dip the finger or back of a wooden spoon in flour before making the hole. Cut the pecans into half. Bake the buns for 15-20 mins until they are golden brown. Remove from the oven and place them on a wire rack. Brush butter or honey mixture over the rolls. Use celery stalk,stalk of bell pepper,walnut, etc. Allspice can be easily replaced with clove, cinnamon and nutmeg powder. Amount of milk required will reduce if you use an egg. To make pumpkin puree at home, I roast the pumpkin (cut into half, scoop out the seeds) for 20-30 minutes in the oven at 180°C. Then I scoop out the flesh and puree it in a food processor. If the puree is pale in colour add a bit of turmeric powder. For more sweeter rolls add ½ -⅓ cup of sugar. What beautiful rolls. They would be very impressive on a dinner table.